beagle wrote: Hey yeah... really nice looking job Jono. Thanks Fenderfan. Yeah my cabs aren't up to Harleys standard but not too bad for a first attempt with little woodworking chops. They are a very easy build, the plans are great and there is always plenty of advice on the forum. PM me if you want any advice on where to get things and what it costs. I'm about to total up the build cost which should be interesting. I'd really like to build some more from the site but can't justify it at the moment. 2x BFM Jack 112 (DIY), Cort Action A, GenzBenz Streamliner 600. Cool build thread on those jacks Jono. Can I ask what the crossover is for? Since you didn't build them with tweeters. Is it a high pass filter to filter out the sub bass frequencies? Also since it has no tweeters around what frequency does it start to cut off? john wrote: Cool build thread on those jacks Jono. They are a low pass filter with a 2kHz cutoff frequency and they increase the sensitivity of the woofer by about 2dB from 1.6-2kHz (paraphrasing the plans). Strongly recommended in the plans so in they go. Even without the tweets, the response is still pretty good up to 3.5kHz (edit: was 5kHz) from the SPL charts. Last edited by JonoSkip on Wed May 09, 2012 8:21 pm, edited 1 time in total. T-Dub wrote: Love those Streamliners. They are a low pass filter with a 2kHz cutoff frequency and they increase the sensitivity of the woofer by about 2dB from 1.6-2kHz (paraphrasing the plans). Strongly recommended in the plans so in they go. Even without the tweets, the response is still pretty good up to 5kHz from the SPL charts. Sorry John, it's actually 3.5kHz which is still pretty good (was at work and rushed it a bit. will edit my post. ). The filter doesn't cut abruptly but rolls off steeply at first but then eventually at around 6dB/octave. The recommended drivers for the cabs all have a rising response in the mid-range so that coupled with the filter gives a good response up to 3.5kHz. The horn design of the cabs AFAIK gives them high sensitivity while being efficient and lightweight. I'm still learning about them though. There is heaps of info on the forum if you wanna learn with me! 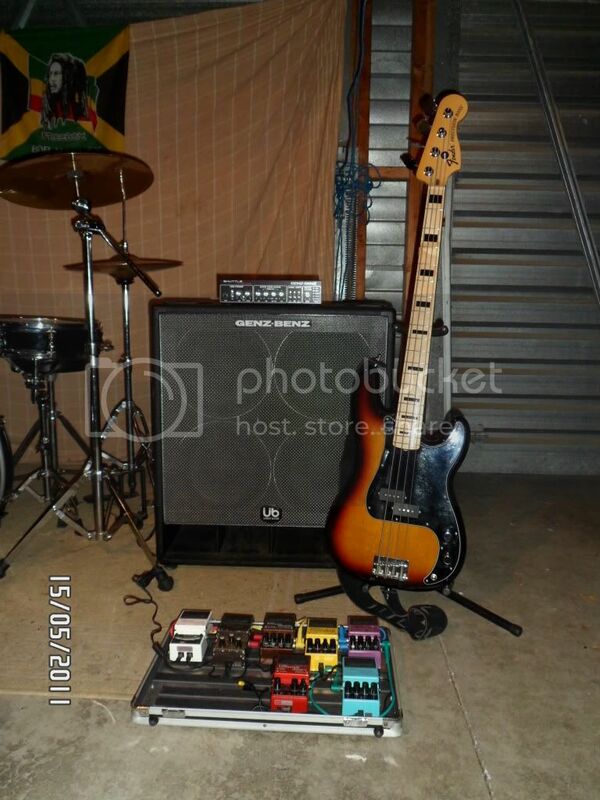 Amp and Bin is win for me,need no other.New Bass and happy with additional effects,....GAS ends ?? bloody hope not ! ps...........having played a Mex and then a US Jazz for well over a decade now, that Japanese P Bass has had the biggest impact on me,wow ! !,what a neck on this thing ! its wider but seems so thin,and these "vintage style" frets (tiny fret wire lol,excuse my ignorance but I never even knew about them until now) ,wish the Jazz had the same fret wire.Its also a lot lighter,the body is smaller, but the tone is so,so different to the Jazz( OBVIOUSLY ), and I do like it,a lot ! excuse for post,try out the new camera the Colonel got for mothers day ! 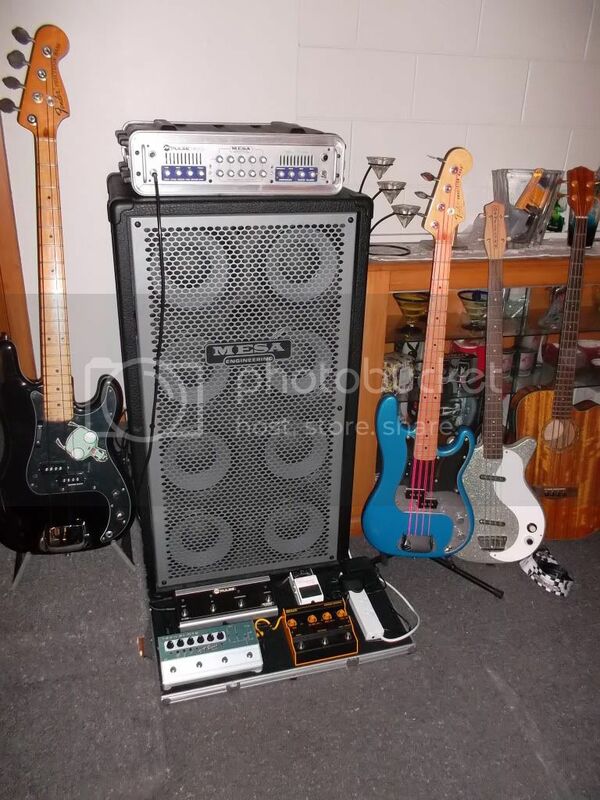 Nice rig Chris. All those pedals I have enough trouble with two hands and four strings, let alone getting a foot involved! JonoSkip wrote: Nice rig Chris. All those pedals I have enough trouble with two hands and four strings, let alone getting a foot involved! Thanks and that is why I dont/cant play drums,my coordination between brain and feet is non existant ! I use the effects at gigs very sparingly,more for jamming fun. Choice !!! 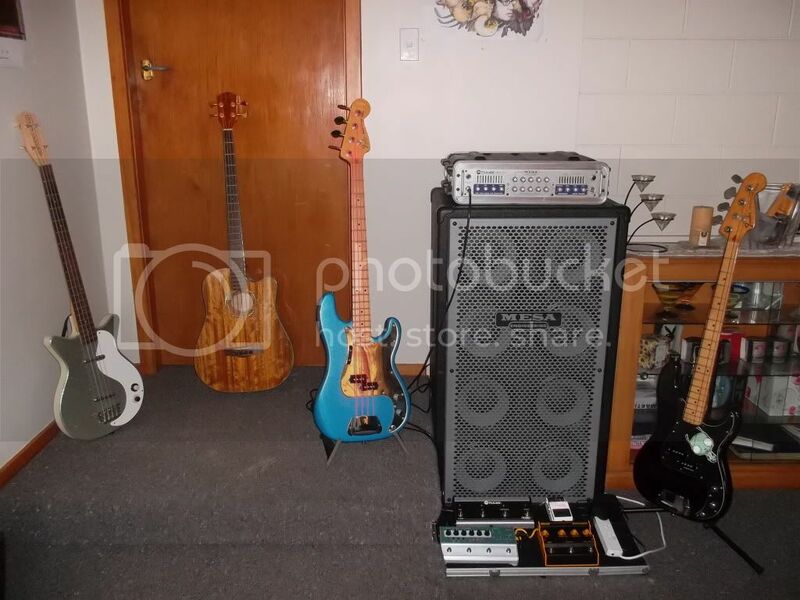 nice transformation, bet it cranks,I do like the bass collection too. 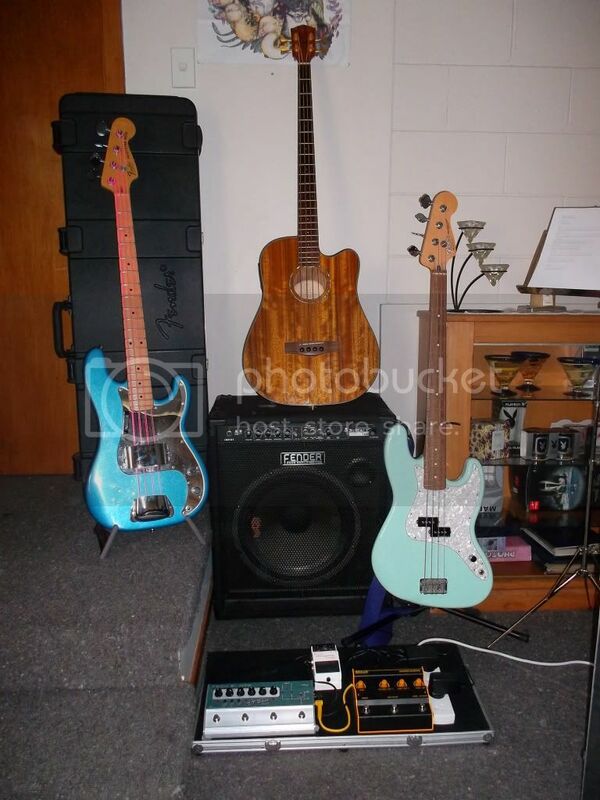 What model is that in the top picture, on the far right with the single tone/volume control? Looked a little mustang-ish? ?